Most young people care deeply about environmental issues and wish to make a positive change in the environment around them. The Eco-Schools programme provides an ideal way for fostering environmental awareness in the entire school in a way that links to many curriculum subjects. The primary aim of the Eco-Schools programme is to educate and empower young people to make positive decisions and become change makers for an environmentally sustainable world. It aims to make environmental awareness and action an intrinsic part of the life and ethos of a school. This should include the students, teachers, non-teaching staff and parents, as well as the local authority, the media and local businesses. Eco-Schools endeavours to extend learning beyond the classroom and develop responsible attitudes and commitment, both at home and in the wider community. Its participatory approach and combination of learning and action make it an ideal way for schools to embark on a meaningful path to improving the environments of schools and their local communities, and of influencing the lives of young people, school staff, families, local authorities, NGOs, and all other bodies involved in this vitally important area of work. View these enjoyable videos to see and hear the benefits of Eco-Schools to pupils and teachers. Filmed at the Eco-Schools Teachers Conference 2018. Eco-Schools Teachers Conference 2018 from Eco-Schools Northern Ireland on Vimeo. Filmed at the Eco-Schools Teachers Conference 2017. Eco Schools, Keep Northern Ireland Beautiful from Claire Lundy on Vimeo. The Eco-Schools programme was developed in 1994 on the basis of the need for involving young people in finding solutions to environmental and sustainable development challenges at the local level, as identified at the UN Conference on Environment and Development of 1992. The programme was initiated by member organisations of the Foundation for Environmental Education with the support of the European Commission. The programme is now being implemented throughout the world: there are schools in Europe, Africa, North America, South America, Oceania and Asia. The number of Eco-Schools is growing as more and more schools take up the challenge and work towards improving their environment through education and action. Sixty-seven countries are now signed up to the Eco-Schools programme, sharing the same methodology and concept, and are identified by the Eco-Schools logo and Green Flag. The Eco-Schools Green Flag, awarded to schools with high achievement in their programme, is a recognised and respected eco-label for environmental education and performance. Here in Northern Ireland, the Eco-Schools Programme is operated by Keep Northern Ireland Beautiful, an environmental charity, and is supported by the Department of Agriculture, Environment & Rural Affairs and other organisations and all of the local councils. Our delivery partners also offer invaluable practical support for the programme. Northern Ireland is now ranked sixth out of the sixty-seven participating countries for number of Green Flag Status Schools. We were also the first country in the world to award a Green Flag to one of its schools. This was Downpatrick Nursery on 15 June 1994. This is a fantastic achievement and one that Northern Ireland can be proud of. All schools in Northern Ireland are now registered on the Eco-Schools Programme. 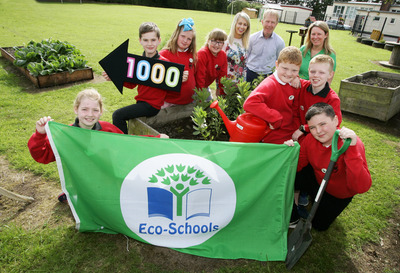 The 1000th Green Flag in Northern Ireland was awarded to Walker Memorial Primary School, Dungannon, in May 2017. This is your opportunity to join an International programme with a rapidly growing community of schools all committed to Environmental Education and Sustainable Development. Any school using the guidelines on this website or in the handbook can adapt the programme to their needs. While the Green Flag award will be given to schools that complete all the essential elements of the Eco-Schools programme, it should be remembered that the programme is flexible, and that different schools will find different routes to achieving Eco-Schools Green Flag status. The Eco-Schools highest award takes the form of the internationally recognised Green Flag. This can be flown outside the school or displayed in the foyer. However, it is important to remember that the programme is one of continual improvement of the school's environmental performance and pupils' environmental awareness and actions. Therefore, the award requires renewal every two years.